Summary The William Rankine Building is the second phase of the Engineering Quadrangle at the University of Edinburgh’s Kings Buildings Campus. Combined with the first phase, the Alexander Graham Bell building, housing the Institute for Digital Communications (IDCOM), it forms one side of the quadrangle which will become the formal central space of the University’s Science Campus at Kings Buildings. The building is the first example of the implementation of the University’s Sustainable Design policy and many sustainable design features have been integrated in a holistic way to create an interesting and comfortable environment with low running costs without the penalty of excessive capital cost. 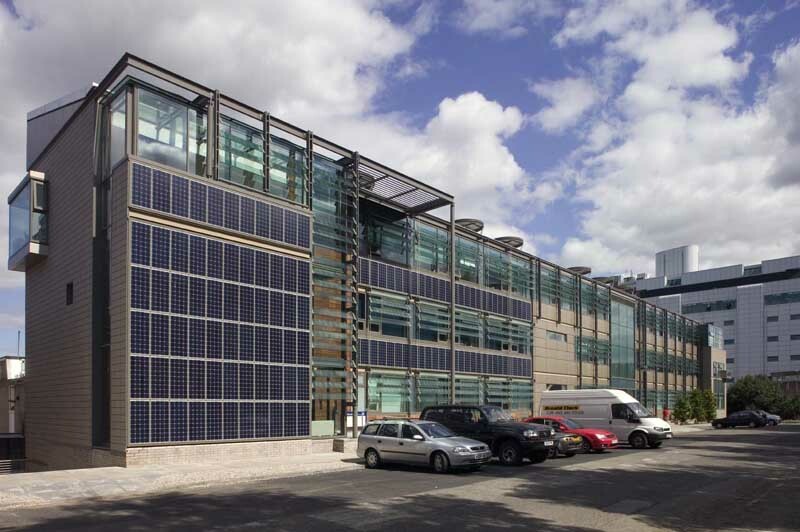 The building incorporates the installation of the first façade integrated PV system (FIS) in Scotland. With the help of a government grant the PV panels were incorporated into both roof and south facing elevation in a way which was cost neutral thus creating “free”electricity. When not required in the building electricity is fed into the Campus Grid.